Most of the posts at Labs are parsed ReadMe.md markdown files from relevant GitHub repositories. I built WPGitHubAPI plugin for this very reason. Look at the parsed content below as compared with this ReadMe.md file. [wga] Shortcode to obtain resources from official GitHub API v3. NOTE: WPGitHubAPI plugin uses transients to cache the counts for 24 * HOUR_IN_SECONDS. u='api_url' where api_url is the part of API after https://api.github.com/ E.g. users/ahmadawais will return my profile data. d='data' where data is the object's data you want to retrieve E.g. followers will return the number of followers for my profile. GitHub Readme Parser with r='y' attribute in the shortcode. Remove h1 with h1=y|n attribute in the shortcode. Convert h1 to h2 with h2=y|n attribute in the shortcode. For more examples read GitHub API Documentation or visit GitHub API. You can use GitHub Updater to receive updates for this plugin. 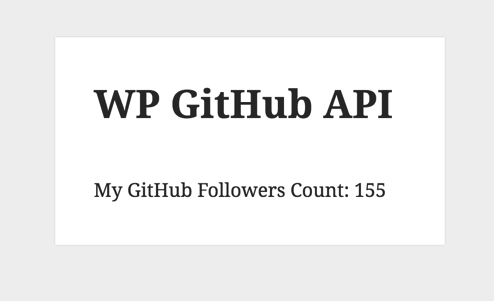 IMPROVE: Gracefully show the GitHub repo link on API rate limiting. IMPROVE: PHP 7 compat — thanks to @tfirdaus for PR #1. FIX: PHP CS Issues like weird spacing and tabs. NEW: Transients below 172 characters. NEW: Should there be h1 with h1=y|n. NEW: Should convert h1 to h2 with h2=y|n. NEW: GitHub Readme Parser with r='y' attribute in the shortcode. NEW: Custom transients names with API_URL and Data. NEW: Regex Remove / in the beginning or at the end. FIX: Custom data related transients. Licensed under GNU GPL v2.0. Copyright (C) 2016 Ahmad Awais.